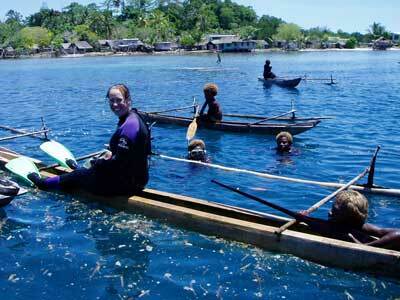 Kavieng is located at the far north-western end of the island of New Ireland in Papua New Guinea. Kavieng was part of German New Guinea from the early 1900s until Australia seized New Guinea at the start of World War I. It was then administered by Australia until 21 January 1942 when it was bombed and three days later it was captured by the Japanese. In March 1944 at least 23 locals were executed in the Kavieng Wharf Massacre. The Japanese responsible where later sentenced for war crimes. The Allies retook the town 1945 but Kavieng had been almost completely destroyed. 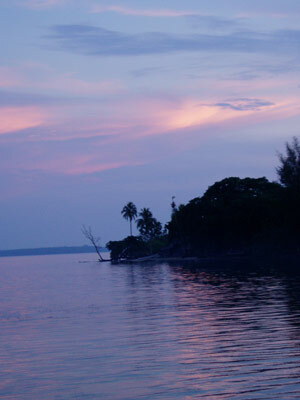 Since then Kavieng has rebuilt and in 2008 the population was about 10,000. It is a very nice little town, with a small shallow harbour (there is only a deep section on the south side). It has a number of hotels, a club, supermarkets and other shops. There are a number of flights each day by Air Nuigini. The planes used are Fokker F100 twin engine jets. Some days there are up to three flights. 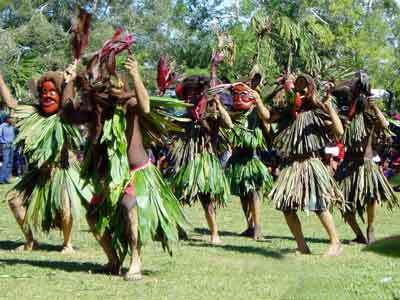 These mostly originate in Port Moresby but some come via Rabaul and other towns. You also need to travel via one of these towns when leaving. 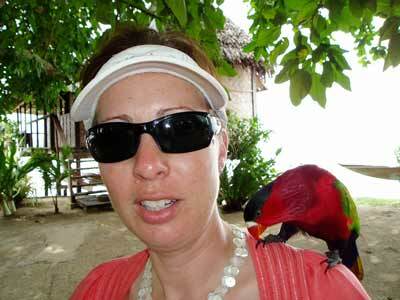 When we visited in 2008, the flight out that was most useful left at the ungodly hour of 6 am, meaning you need to leave your resort very early (4:30 am in the case of Nusa Retreat). Flights can often be late (ours into Kavieng from Rabaul was changed to be earlier and then ended up marginally later than planned). Weight is not a problem as the planes can carrying lots of luggage. There are a number places to stay in Kavieng town. One is the Kavieng Hotel (looks basic with air conditioning). The other is the Malagan Beach Resort which is a few minutes walk from the town centre. This has a lot of rooms but looks sterile (if you know what I mean). 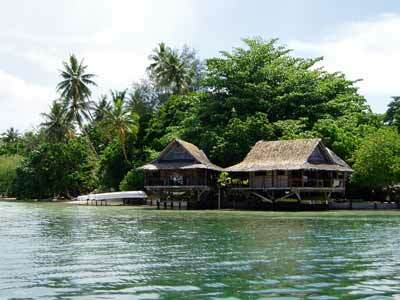 On the islands off Kavieng there are two further accommodation options. The closest is Nusa Retreat about three minutes from the wharf and Lissanang Island Resort which is about 30 minutes or so away. I did not see Lissanang at all. Nusa Retreat is located on Nusa Lik Island which is the southern of the two islands off Kavieng (the other is Nusa Island). The retreat is quite small, in fact much smaller than I thought it would be. I had expected it to take up a fair bit of the island but it is confined to one corner, probably about 100 metres by 150 metres in size. The retreat has two overwater cabins (more about these later) and a number of other cabins. There is also a larger "home" that holds perhaps six or seven and would be perfect for a small group. It has toilets and showers. The land based cabins do not have their own toilets (the large one might) and it is a minute's walk to them. The overwater cabins cost more and are quite something. They have a double and single bed as well as toilet and shower (not heated but nice). There are mosquito nets over all beds as well as fans. Power is from a generator that operates 24 hours. There are a number of power points in each cabin, but a small power board should be taken if you are charging multiple things like cameras, strobes and torches. However, despite the comments about the overwater cabins, I do not think that I would stay in them if I visited again. This is because at night they were much warmer than the land-based cabins. I assume that this is because the water is over 32ºC in the shallows and the warmth seems to radiate up. Even with fans running, we were sweating at times. 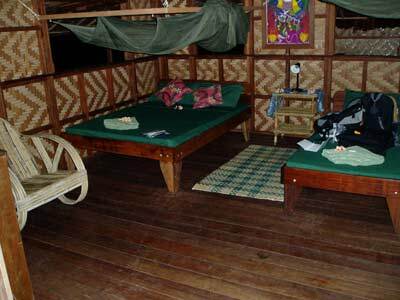 The verandahs on each cabin were a nice spot to sit in the afternoon while reading or before dinner for drinks. Once at Nusa, you can take off your shoes or thongs and not put them on again. You walk around in bare feet as the ground is all soft sand. Before you walk up the steps into you cabin, you dip your feet in the bowl of water and wash off the sand. See Food and Drink for information about the rest of the resort. If you are staying in Kavieng you have a number of options apparently. 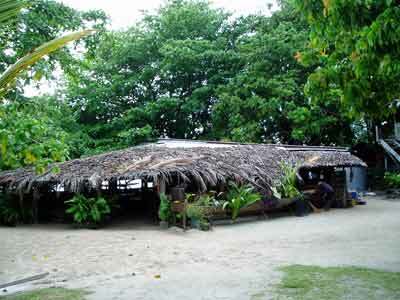 As well as the Kavieng Hotel, the Kavieng Club and the Malagan Beach Resort, there are a number of other small restaurants. If you stay at Lissanang Island you have no option but to eat and drink at the resort. If you stay at Nusa Retreat you can go over to Kavieng for a meal, but the cost of the transport would only make it something to do once on a trip. The seafood buffet at the hotel on Friday nights is said to be excellent. If you go to town for a visit, the hotel has cold beer at K6 (A$3). Meals at Nusa are not included in the tariff. Breakfast and lunch are ordered off the menu. The dining area and bar are in the main open sided building with the kitchen. This has a sand floor and a number of long tables and benches. There are also two more tables under cover between the building and the water. This is where we generally ate lunch and dinner. The breakfast menu appears to be quite expensive. Tea and coffee are free. Lunch is varied in value. Toasted sandwiches are K12 (A$6), spring rolls, chips and salad K26 (not great value) and other things like chicken curry, soup etc. Dinner is a fixed price buffet. This is nominally set down for 7:30 pm, but sometimes was as late as 7:45 pm. To be honest, it would probably be better off at 7:00 pm considering the day you have probably had. Cost is K55 (A$27.50) no matter what you have. For people who like seafood, it is a bargain. For people like me who do not eat most seafood, it was only reasonable value and for pure vegetarians, it is a rip-off. Every night there was at least one and sometimes two seafood dishes. Every night there appeared to be either crab or lobster, some nights oysters, some nights calamari. Other dishes included pork, chicken, beef, sweet potato, salad and rice. There certainly was not a shortage of food. Dessert each night was cake and ice cream. The bar here is quite extensive, with many kinds of beer (South Pacific Lager K6), soft drinks (K3-4), wine (K60 min up to over K160 for only average wine), spirits and even cocktails (expensive like a big hotel). There are also snacks for sale, but some nights they had complementary ones. You are not permitted to drink your duty free in the bar area so we had pre-dinner drinks on one of the groups' verandah before dinner. The night we had drinks on our verandah overlooking the water of the harbour was really nice. We got ripped off the last night when we were told that there was a happy hour where all drinks were half price. We specifically asked about wine and it was confirmed that this was included. Guess what, the bill had the full price and when queried, we were told that it was not included. As mentioned, this is a bit more upmarket and it is certainly not as relaxed as where we stayed in Kabaira or places like Deco Stop or Coral Quays in Vanuatu. However, it was nice and we had no problems. There is a dive operation at Lissnenang Island but I cannot report on it. 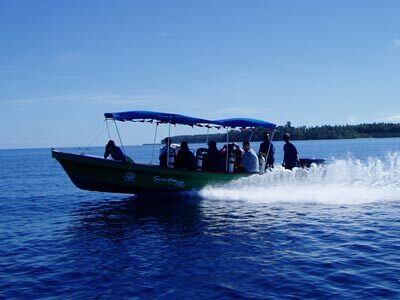 The dive operation that services Nusa is Scuba Ventures Kavieng. This is run by a South African born couple Dorian and Cara. 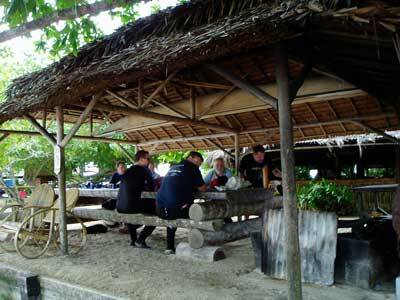 They are based at the southern end of the town right on the water almost opposite Nusa Retreat. They have three banana boats, each powered by twin Yamaha 60 hp motors. These are capable of taking six divers, double tanks and at least two crew at speeds of about 43 km/h. It is quite easy to get into and out of the water and the boats are stable. They have a cover and cool water is carried. In between dives you get a snack of fresh fruit and coconut. The dive operation is relatively relaxed. However the week before we arrived they had a group that included a person who seemed mentally unstable (we saw his rantings the night we arrived) so I think that Dorian and Cara were a little uptight from a number of run ins with him that week. That been said, the operation ran very smoothly and all our requests were met. All dives are double dives with arrival time back at Nusa well before lunch for most. When you go a bit further afield you may have to cut make sure that your bottom time is not so long that you miss lunch (we got back one day just as the restaurant closed at 2 pm). On another day we arranged for a packed lunch to have out as we were doing three dives over one hour from the resort. Dorian leads divers on one boat and Cara the divers on the other. Most dives were not drift dives, although we did do a few that were drift dives. All tanks are 11.5 litre aluminium. As a group (or if you book 10 dives), you will get two free dives on aircraft using the residual air in one of your tanks. You can also do a shore dive in front of the dive shop after lunch. I did not get the chance to do this but all our group who did it (some twice) reported that it was great. You can also do a cave dive if you are very experienced and really good on your buoyancy. As a group, you get a free beer cooler ("skin blong bia" in Pidgin) as well as a free video put together with stills and video from your group (mixed with stock footage). This last feature is brilliant for those without cameras. All in all, the dive operation was excellent, willing to meet our requests and with a very good safety edict. There are wrecks, Japanese and Australian World War II aircraft and reef dives. Click here to go to the list of all the dives I did while at Kavieng. You can go for a walk on Nusa Lik Island (the island the resort is on) but this does not take long and there is not that much to see. You can also go over to Nusa Island. 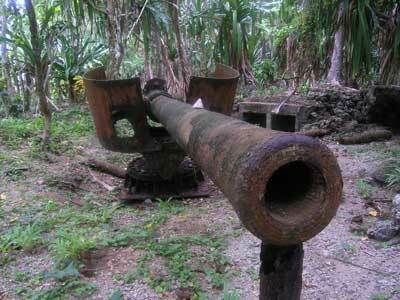 There are remnants from the War here, including two large Japanese guns. You can also see these guns if you swim to shore while doing your surface interval at Blow Hole Caves. You can also hire sea kayaks and go for a paddle. A few from our group did this on the last day but I was not up to it (bed at 2:30 am and someone spiked my tonic water with gin!). You can also get a lift across to town and go for a walk. I believe that groups get one free transfer to and from town. We were then for PNG's Independence Day (16 September) so we went up to the Court House Oval where there was a big dancing and singing display. When we arrived, we went to the side of the enclosure that had been built to keep the crowd separated from the performers. We were only here are minute when an official came up to Kelly and said "come this way". He took us to a spot and started moving all the locals out of the way. We were a little embarrassed that these people were going to lose their prime positions to let us see the dancing. Wrong! He made us go onto the field and sit in front of the fence with the children. Less that two minutes later another official comes up and says "no, no, you cannot sit there!". Oops, we are in trouble. "The performers come through there, come and sit here". With that, he led us right up to the front of the enclosure under the temporary roof and in front of the official "grandstand" and made us sit there. We had the best seats in the house. Even better than Sir Julius Chan, the former Prime Minister and now Governor of New Ireland who was sitting behind us! Anyway, we saw a lot of great dancers, including some with a sort of "mudman" mask that had the crowd laughing the whole time they danced. It really was quite touching to be treated this well. Imagine if a bunch of Papua New Guineans came to Sydney, would we do this to them if they came to the Australia Day celebrations at Sydney Harbour? I think not. After the presentation of a million prizes for things like best dancers, best bands, neatest villages and more (guitars, kerosene stoves and lanterns and Kina - money), we walked back via the ice cream stall and then to the Kaveing Hotel for a cool beer. If you are in PNG on Independence Day, I strongly recommend going to whatever event is on in your area. This was an excellent holiday. The diving was great, the accommodation and dive operators first class. I really can recommend this as a dive holiday. Note that it would also be suitable for non-divers so long as they are happy to relax, read and swim while you are out diving in the morning.